This post was supposedly for a school event that I sadly wasn't able to attend. The content is also available on this Slideshare page. Digital marketing is definitely the new “in” when it comes to business promotion and even for personal and professional use. The digital world has opened a whole new market for businesses and professionals to promote their products and services to web users. In affiliate marketing, websites or businesses promote their products or services through affiliates who will in turn link to the source using their own websites or blogs. Affiliate option can be either offered directly from the website or through third party service like CJ Affiliate by Conversant (Commission Junction) or ClickBank. Amazon is also a popular network for affiliates. Affiliate marketing is one of the ways to monetize blogs in case you are interested in blogging. In the other post, I’ve covered a few details about blogging. This is done through display or banner ads or even text based links shown through websites, blogs, social media pages, and even search results. Google Adwords is the most prominent display advertising medium, reaching about 90% of web users worldwide according to what some sources claim. Facebook also offers display ads. Email marketing is still used to connect with potential clients and customers although a lot of it can be considered spam and end up labelled as such by email providers due to consistent email user complaints. A simple click on the “report as spam” button will prevent future emails from the reported source to ever land your inbox. Shady lead generation, i.e. collecting email addresses through companies and individuals selling such information is also considered spam. This is why we receive unsolicited emails. But there are also cases when simply subscribing to newsletters, RSS feeds, and any offers will include you on a company’s email list. Email marketing is made possible with the use of software like Aweber which helps manage emails sent out. This is also called search engine marketing which is quite similar to what display advertising is all about except only search results are targeted. This is not limited to Google but other search engines as well including Yahoo or Bing. Search engine optimization (SEO) is somewhat related but not the same as search marketing. In SEO, a website is improved through various techniques in order to help it rank better in search results related to certain target keywords. Ideally, the first page of search engines like Google is the main objective for SEO campaigns. Still in relation to SEO is content marketing where promoting anything is focused through written content that are published through article directories (like Ezinearticles), revenue-sharing sites (such as Squidoo and Hubpages), press release sites, and even related websites or blogs which accept guest posts. Here, the written content is published with a link back to the site or page promoted. The link is often included through the author bio section or anywhere else within the article. Here, all marketing efforts are geared towards social media sites like Facebook, Twitter, YouTube, Instagram, Pinterest, Tumblr, Stumbleupon, and other related sites. Websites and businesses create profiles through these social media platforms and reach out to a target audience through regular updates and even advertisement. Marketing is also possible through SMS, MMS, ringtones, apps, game ads, and other options available through mobile phones, particularly smart phones. How mobile numbers are collected can be similar to the method used in email marketing where you opt in for certain services, allowing companies offering such services to contact you. In some cases, you are automatically subscribed upon purchase of a specific type of SIM card of service (prepaid or postpaid). The increasing popularity of digital marketing had resulted to a similarly rising profession, digital marketer. This web based work involves responsibilities which include any of the digital channels listed above. Digital marketers can work on a part time or full time basis as a freelancer or as an employee of a digital marketing agency locally or through companies overseas. Clients can be found through freelance sites like Upwork, Freelancer, Fiverr, LinkedIn and other related sites. For those who are interested in digital marketing, there are various posts you can read online. Comprehensive training materials are also available through free or paid courses online or offline. In conclusion, as web usage increases, so will digital marketing. Businesses will continue to take advantage of the opportunity to promote their products and services online through any of the channels listed above. 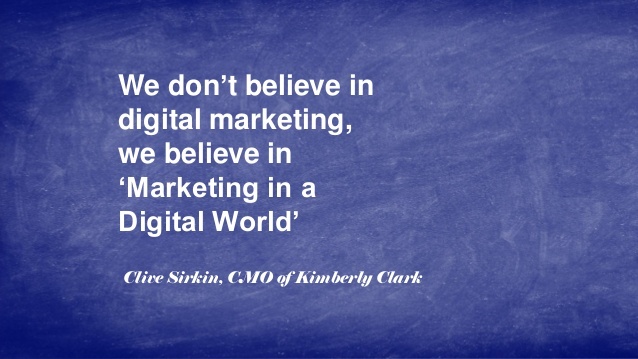 Hence, it's no longer merely digital marketing per se but marketing in a digital world.